Every campaign has organizations that pull the secret strings of the world, toppling monarchs or leading revolutionaries toward freedom and war. These secret societies, bardic colleges, wizard academies, military orders, and religious cults capture the imagination—and now your PCs can join Golarion’s own movers and shakers with the Pathfinder Chronicles Faction Guide. This book presents a new and detailed rules system for PCs who throw in their lot with one or more of these groups, as well as the responsibilities—and rewards—that membership entails. With membership in a faction, PCs gain a whole new reason to adventure, as well as countless roleplaying opportunities in any sort of campaign, from dungeon crawl to courtly intrigue. In addition to new goals and motives, membership in a faction comes with tangible in-game benefits. Gain enough of a reputation with the Hellknights, and a PC can become a fearsome lictor, complete with Hellknight minions. Gain prestige with the Pathfinder Society, and a PC adventurer can get his foot in the door to become a venture-captain. Everything your players need to infiltrate the halls of power is right here. Rules on how to gain prestige with various factions and how to use it to secure items, boons, and allies. Twenty-four sample factions and the specific benefits of joining them—these factions include the fearsome Red Mantis assassins, the notorious Whispering Way, the righteous Eagle Knights of Andoran, the demon-hunting Mendev Crusaders, the calculating Prophets of Kalistrade, and the blasphemous Church of Razmir. Standard rewards available through every faction, such as helpful spells, expert hirelings, and access to specific magic items and equipment. New feats, spells, magic items, and traits for all factions. 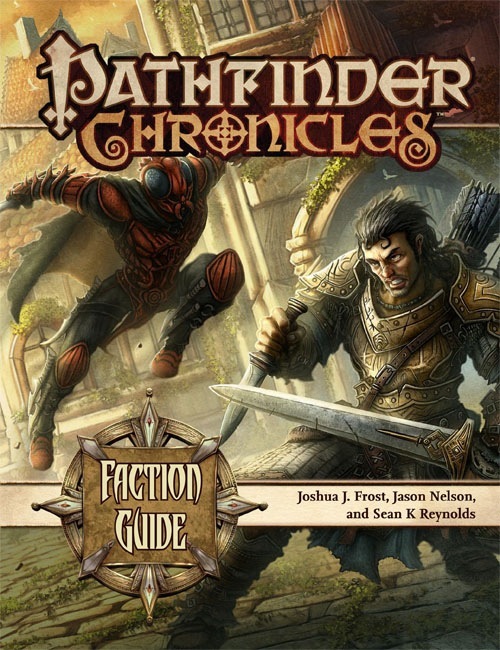 This book is intended for use with the Pathfinder Roleplaying Game and the Pathfinder Chronicles campaign setting but fits easily into any fantasy game world. This product is out of print. For the longest time, I always wanted to run a pathfinder/3.5 Ravnica campaign. But seeing that I never GM before, I was nervous as to how the guilds would function. This book helped. It gave me the tools needed to support the my campaign. I don't recommend this book to those who aren't guild/group heavy. But to everyone else who need advise as to what spells/equipment/boons would fit each guild/group, this book is a great place to start. Great for fleshing out power groups . . . This book has some great information for giving you some snapshot information of various power groups in the campaign setting, without getting too in depth, so that players can get a taste for them. The faction point system seems to work well, and is pretty much the same one that is in effect in PFS organized play. My biggest concern is that too many factions in the guide have rewards that have to do with granting followers, which can be a pain for a GM that doesn't quite know what to do with those extra bodies, especially when some of them are implied to being active participants in adventures (like bodyguards) instead of just non-combatants for roleplaying purposes (which some of them are). One of the Best Suppliments. Few Suppliments challenge a player to think of their characters motivations more than this one. Nationality, ethnic origin, race, all shape us, but what we choose to join, that defines us. This is a great piece of work. I love the Faction Guide because it has 24 factions that hve different flavors. They endulge your players to add that flavor to their characters. Like the Kusari-Gama be all the monk that you can be and some more! and you get rewards! Players must love this. I think it should be a for both DM and PC. For me? a must have to spice up a character. I really enjoy the way the new rules can be included or not; the non overbearing nature of the new mechanics is a nice addition. If i wanted I could use the book without the mechanics and that makes my day. If a dm wants to add something to tie his players better to the world this book does that. Will this have prestige classes? I sure hope so. I would love to see a Hellknight and an Eagle Knight PrC. Wes and James said that the Hellknight PrC will be in one of the support articles for CoT. Given that some of my favorite Realms books were Cloak and Dagger and Lords of Darkness, I'm really happy to see this on the schedule. It will be interesting to see what this adds to various factions, and what kind of interaction between them it might illuminate. Okay. I just claimed that all I will ever need in my gaming table is Gamemastery guide and NPC guide. I'll certainly have to add this one to the list. Don't forget PFS Scenario #35 also! They don't go up to 35. Do you mean #25? (Which I won't be able to see until it's released on Wednesday)? Maybe he's from the future? #35 was the one that participants in the PFS Open Call Workshop at PaizoCon were submitting proposals for. It will involve a return to the museum! Suh-weet! I will be looking forward to that! I can't wait until...[*Quickly does math in head*]... October! 'Cloak and Dagger' and 'Lords of Darkness' are excellent books, and also my favorites along with 'Faiths & Avatars'! I have high hopes for this one, because Sean co-authored C&D with Eric and Steven and LoD with Jason Carl. @Sean: Those "group photo" type of pictures in C&D were an ingenious idea... any chance for something like it (i.e. one art piece that portrays the faces of the main NPCs in each organization) in this book? I'm especially eager to see the coverage for the Revolutionary Leagues of Galt. I have a friend who's a nut on the French Revolution, and he's been filling my ear with tons of ideas for Galt and its Perpetual Revolution. The main one I can remember right now being, "every time a new regime comes to power in Galt, the calendar gets restarted at Year 1 of the new Republic of Perfect Virtue." I'm not sure that sort of format would work for this book. 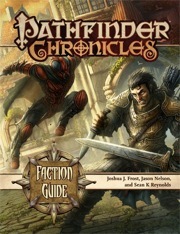 Keep in mind that this book isn't so much a "here's all you need to know about all these factions" book (because some of these factions already have dozens of pages on them and some have almost none) but a "here are specific mechanics to use to carrot-and-stick your PCs into getting involved with these factions." So it's not really "here are the leaders of the orders of the Hellknights, their goals, and ongoing plots" (though that information is summarized in this book) because that sort of thing was covered in a contemporary Pathfinder, it's more of a "if one of your PCs has been doing missions for the Hellknights for 6 levels now, here's the cool gear/magic/feats/ranks/titles he has access to as part of the organization; and for 9 levels, and 12 levels, and 15 levels...." For example, if one of your players is really gung-ho about the Hellknights and wants to know "what do I have to do for my character to become a paralictor in the Order of the Nail?," you'll be able to tell him, "do missions for the Hellknights to increase your prestige level with them, and when you've accumulated X prestige, you can spend Y amount and you'll be a paralictor." Mind you, that isn't some honorary title--the PC would actually be a paralictor. I mean, if a PC spent Y prestige to get a +3 sword but received a sham sword with no actual combat bonuses, that would be LAME; likewise, if you spent 40 prestige to get a title in the organization and it's useless and honorary, that too would be LAME*. So if you decide to spend your prestige on becoming a paralictor (rather than, for example, spending prestige to hire and outfit a small army of young Hellknights to do a mission for you or guard your personal fortress), you get all the rights and responsibilities of being a paralictor. You worked for it, you've proved yourself to the Hellknights, you've earned it. Likewise for the Eagle Knights, the Pathfinder Society, a bardic college, the Old Cults, the Whispering Way, the Green Faith, and so on. Many of these factions will be more about physical rewards or lore than titles, of course--get in good with the Old Cults and you may get to copy stuff out of their best copy of the Necronomicon; advancing the cause of the Whispering Way may earn you a known-to-be-accurate formula for becoming a lich; the Pathfinders might let a valued member borrow something from the Vault; the Green Faith might arrange for a treant to be your cohort. And so on. It's a book that covers "what are these guys about?" as well as "how do I reward my players for participating in storylines involving these guys?" *Not to say that ceremonial swords and honorary titles aren't cool, but functional swords and actual titles are even cooler. It's not sad that these three words alone have made me buy this product, is it? Actually, that sounds amazing -- we not only get the information about what it takes to become a Paralictor, but also what you get and what it *means* to be a member of that respected and feared inner circle (BTW, don't bother including the Andoran Chicken Knights -- all of us already know that all it takes is some money out of your daddy's pockets! ;P). You know, in retrospect I realized that the sort of thing I asked about (specific NPCs of all levels with portraits) are probably better left for 'NPC Guide'. Tons and tons of awesome! This could be better clarified in the product description. I can't think of anyone I play with frequently who wouldn't flip over backwards in anticipation of this one. I don't think the current description makes the real purpose and content of the book clear, though. Amen.. SKR's latest description really just put this book on the radar, as far as I'm concerned. SKR: You should edit that little essay and put it on the Blog. This book would sell like crazy! I second that. This description casts a whole new light on the product and could be a major incentive to buy the book (as is proven by at least one comment in this thread). Very true; I, too, had misconceptions, and I can't think of a Golarion-based group that wouldn't be interested in this book! As with most of our preliminary descriptions, it was actually written well before work started on the book. Once they write up final back-cover copy, I'll replace it with that. I would really like a full list of the pathfinder prestige classes and what books they are in. I have the core rules and the campaign setting, but nothing else at the moment. Can anyone point me to a list of prc's? I've updated the image and product description to match the finished product. Is that the full authors list, or is this like other recent books in the line with only a few of many authors listed on the cover? I believe there are other authors involved, but those three on the cover wrote the bulk of the book. I'm still giddy at the thought of getting Whispering Way info! What James said. I wrote up two factions, which was a pretty small amount of material given the number of groups covered. As I recall a number of other folks also worked on this one besides the cover billing big names *wink* and me. Of course, everyone gets proper credit on the inside, we just try to stick to three or fewer names on the cover because too many looks clunky. There is not an explosive rune in this spoiler box. I know the big groups are going to be covered here, but I hope some of Golarion's minor organizations also get detailed. Groups like the Coils of Ydersius and the Blackflame Adepts (I think that's what they're called...) received tantalizing but oh-so-short write ups in the Campaign Setting, and I've been looking forward to learning more about them. Here's hoping. We don't cover either of those in this book (there really are too many orgs in the world to cover them all in just 64 pages), but the good news is the two-page format we created for these things means we can easily slip in an organization writeup into any suitable product. For example, there's a new gnome faction in Gnomes of Golarion called the Wonderseekers (their mission is to save gnomes at risk of succumbing to the Bleaching). So you may see more info on those orgs appear in another sourcebook. CURSE YOU FOR ADDING MORE CRUNCH TO PFRPG !!! I canz has Old Ones?? One element that I loved about Eberron was the organizational intrigues. Sounds like Golarion is opening its doors to the webs of perspectives. I'd like to see something on the Long Axes; Ulfen elite mercenary bodyguards to the Taldoran Empire. Reminds me of the historical Varangian Guard: Viking bodyguards of the Byzantine Emperor. Regardless, I imagine a product like this a great way to bolster the foundation of any new Pathfinder campaign, or a great way to flesh out one already in the works. I am really looking forward to this product. My group loved the Affiliations as they were presented in the Savage Tide AP, and I have been working diligently preparing for me CotCT campagin use the affiliations from STAP as a prototype. Which book(s) mentions the devil nuns? Skimming through the book, I like what I see. Some will probably argue that the factions presented needed a lot more detailed information but I actually like the amount of information that's given for each faction. Enough material to whet the appetite of players and GMs and enough mystery to allow GMs to expand on the factions. The Prestige Awards seem like a cool mechanic to use when dealing with these factions. Page 83 of the Campaign guide mentions the devil nuns in passing. Is the Darklight Sisterhood in there? If so I'm definitely getting it!!! !